The name Nubian was given to the original inhabitants of Nubia, a thin settlement along the Nile River in southern Egypt. The Arabs, who invaded much of North Africa in the seventh and eleventh centuries, displaced some Nubian groups and absorbed others. As a result, thousands of Nubians are now “Arabized,” influenced by the Arab culture, language, and religion. Some Arabized Nubians seasonally migrate with their herds, living in temporary camps. Most are peasants who live in villages in rural areas. Their houses are simple, round dwellings with grass-thatched roofs. 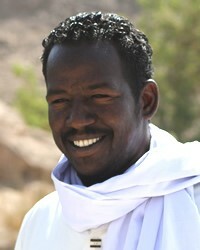 The Nubians have held to their current worldview and religion for centuries. Change is very difficult. Scripture is available in the Egyptian dialect of Arabic, as are many other resources which communicate the Gospel. 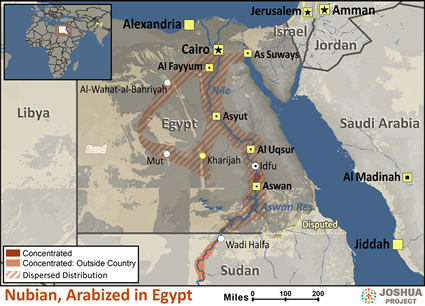 Pray Egyptian Christians will be lead to take the Gospel to the Nubians. There are no known followers of Christ among the Arabized Nubians. But Rev. 5:9 says men were purchased from every tribe. Pray for the Nubians who will soon come to Christ, that they will be accurately taught the ways of Christ, and will follow him with a whole heart. Pray the Lord’s Spirit will increasingly draw the Nubians to Jesus (Isa in the Koran), giving them a growing desire to learn about this man. Perhaps the Lord will communicate to some via dreams and visions. This entry was posted in Egypt, Unreached millions. Bookmark the permalink.